Worldwide golf tour operator sales notched up a seventh consecutive year of growth in 2018, according to the 2018 Golf Tourism Report by global golf tourism industry association IAGTO. Golf tour operators saw sales surge in late 2018, with strong forward bookings continuing at the start of 2019. However, the report also notes that the rate of growth in golf visitor arrivals globally is slowing down, in line with IAGTO forecasts. IAGTO supplier members comprising golf resorts, golf clubs and hotels, who provide the best measure of empirical growth in golf tourism worldwide, reported overall growth of 3.2% in golf visitor arrivals in 2018. That is considerably less than the growth reported in 2017 but does reflect IAGTO’s projection of a slowdown in the rate of growth of golf tourism due to demand exceeding supply in the most popular golf destinations at the busiest times. North American golf destinations performed well with Asia Pacific suppliers coming in just above the average, at 3.7% year-on-year growth. Increases in golf visitor arrivals were the smallest across Europe, where the average incremental growth was down to 2.2%. As has been the case now for seven straight years, 2018 was yet another strong year for golf tour operator sales globally with average growth of 8.6% year on year, very similar to the 8.8% growth reported in 2017. Golf tour operator sales can grow at a different rate to supplier golf visitor arrivals because tour operator bookings are only one channel of business for golf courses and hotels, with direct bookings also playing a major role in many destinations, explains IAGTO CEO Peter Walton. Outbound operators from North America surpassed last year’s gains and European operators maintained their performance, but the growth in golf travel sales of Asia Pacific tour operators has dropped off since 2017, although the average growth last year of 4.8% year-on-year was still above the average growth in leisure tourism worldwide. Golf tour operator sales in the third quarter of 2018 were up on average 6.0% year-on-year with North America and European operators running ahead of the curve. Forward bookings taken by golf tour operators globally as of January 2019 were looking strong once again, indicating a good start to yet another year. To back this up, suppliers also reported healthy forward golf visitor bookings in January up 4.9% year-on-year with Europe this time leading the pack with business booked up 5.1%, Asia Pacific golf destinations up 3.6% and North America up 2.1%. Outbound markets performing particularly well this winter (October 2018 to April 2019) include Finland, Norway, Spain, Portugal, Italy, Ireland, the Czech Republic and Poland in Europe, as well as the USA, Japan, Thailand and Hong Kong. “It is interesting that both Germany and the UK report similar steady and sturdy figures, despite being on either side of the Brexit divide,” says Walton. There are some notable trends among specific golf destinations for 2019, with Turkey, Tunisia and Morocco resurgent – which is likely to put pressure on Spain on Portugal, whose forward bookings are up only 2.2% and 1.5% respectively. But Walton notes that the Mediterranean coast of the Iberian Peninsula is limited by capacity during the most popular months and is already doing very well. 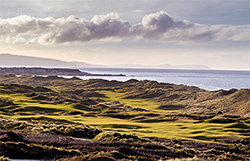 In Europe’s summer destinations, Northern Ireland once again is leading a strong pack, bolstered by hosting the 148th Open this July at Royal Portrush (pictured), and is followed by Scotland and Ireland in terms simply of rate of growth in forward bookings, not of course in terms of the number of golf visitors. Also repeating gains accrued last year is Vietnam, joined in 2019 by Japan which is beginning to see interest peak as its many and varied golf destinations position themselves to attract international golf visitors, some for the first time. Most other destinations are reporting steady growth. “So 2019 is going to be a year to watch with golf travel quite fluid in terms of destination choice with a larger field than ever before set against a backdrop of steady but not rampant growth, with golf tour operators continuing to play a strong hand in both delivering golf visitors and showcasing new golf courses and new destinations,” IAGTO’s Peter Walton adds. The 2018 Golf Tourism Report was compiled by IAGTO. IAGTO began its Quarterly Golf Tourism Survey in 2015 collecting and analysing data from 750+ golf tour operators, golf resorts, golf courses and hotels every three months and more than 1,000 companies once a year. Some of the headline data from the 2018 annual survey is presented below. Please note that while these figures are an accurate representation of the data submitted from the companies that completed the survey, they can only be used as an indication to global trends.